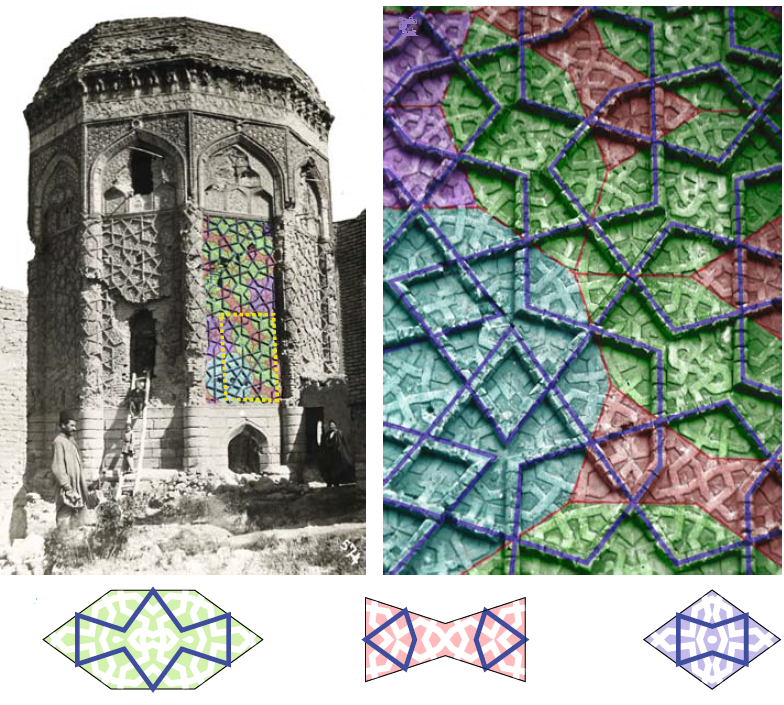 In next applet you can see the decorative line pattern and the girih tiles of the mausoleum in Maragha. Due to the great freedom in matching the tiles a line pattern can be created that looks random. The pattern runs continuously over the edges of the monument. These edges are marked with a dotted line. 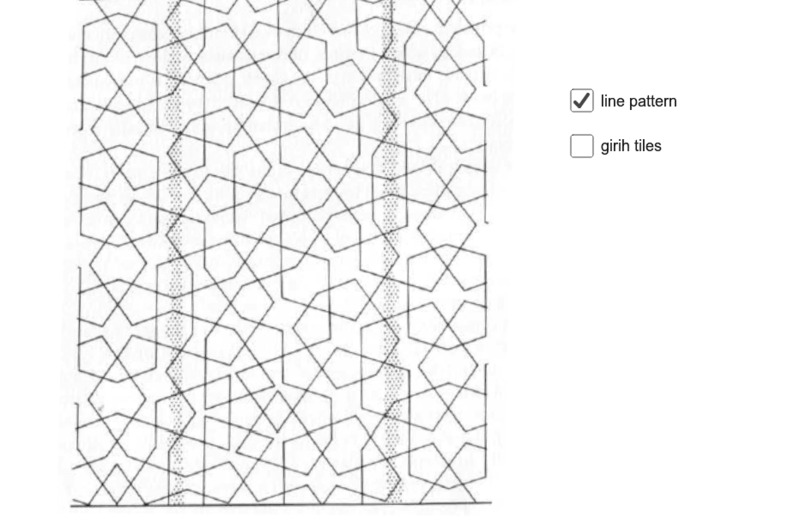 How to find the underlaying girih pattern? You can find the underlaying girih pattern by constructing the bisectors of the intersecting decorative lines. Connecting these intersecting points mark the girh tiles. Left you see a wall pannel colored with girih tiles. Right the yellow rectangle is zoomed in. Below you see the tiles used in the pattern. The blue zigzagging lines are clearly marked in the pannel because they're sticking out of the wall surface. The white lines are just slightly sticking out of the wall and form another line pattern. On the pictures of the tiles you can see that the pattern of white lines is symmetrical horizontally an vertically in the tiles. So two types of symmetry, not compatible with each other, are mixed. The white lines are continued over matched tiles, but the 2 fold symmetry isn't. To create such a tall not regular tiling with so many lines is quite impossible with straighted edge an compass. It's a strong argument for the theory of Lu that another method was used. And indeed, just matching girh tiles is an easy alternative for it.